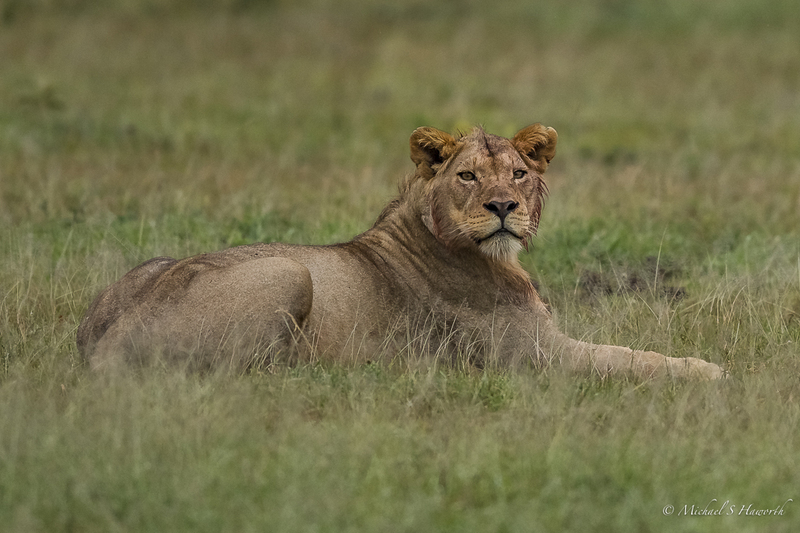 This post shows some images taken during our second day in the Western Corridor of the Serengeti. 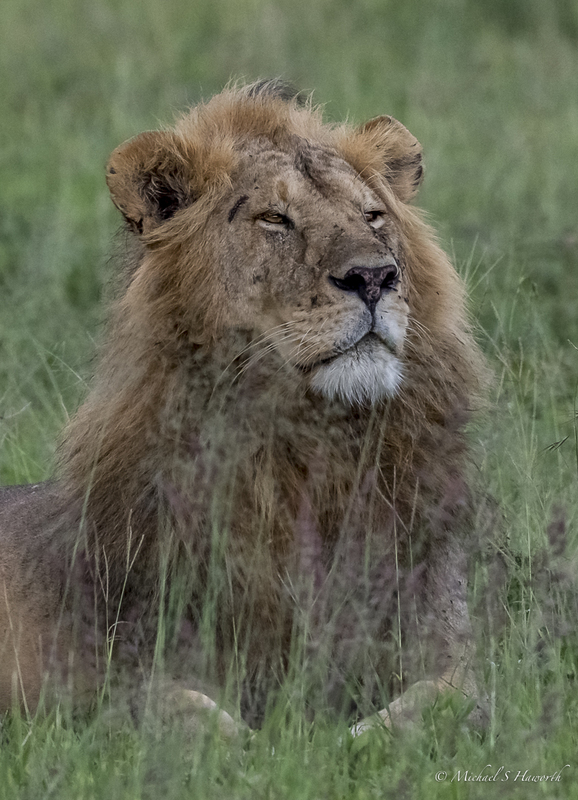 We were based at the wonderful &Beyond Grumeti Tented Camp and were part of the CNP Safari’s photographic group led by Lou Coetzer and Wasiri, our &Beyond guide. 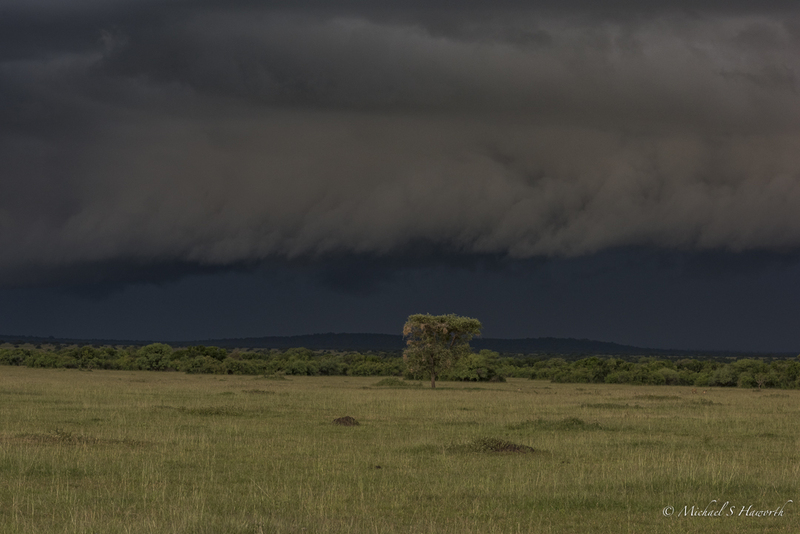 We were in the Serengeti because we expected the “short rains” to be over but were in for a surprise. The Western Corridor is a spur of the Serengeti which stretches out to the left beyond Seronera past the Musabi plains towards lake Victoria. This is a unique part of the Serengeti because there is a high concentration of game in this area all year round. Lake Victoria has a unique influence on the weather and rainfall in this corridor. This means it is wetter and there is grass all year round so there are plains game in this area all year round. Plains game such as wildebeest, zebra, eland, Topi and Grants and Thompson’s gazelle. There is obviously not the concentration that you would see during the migration but more than enough to create wonderful photographic opportunities. The next image was taken before the sun was up. This pride of lionesses and adolescents were making their way along the side of the main road which runs down towards the Nyasirori ranger post. On our way east, we drove down to Nysasirori dam. 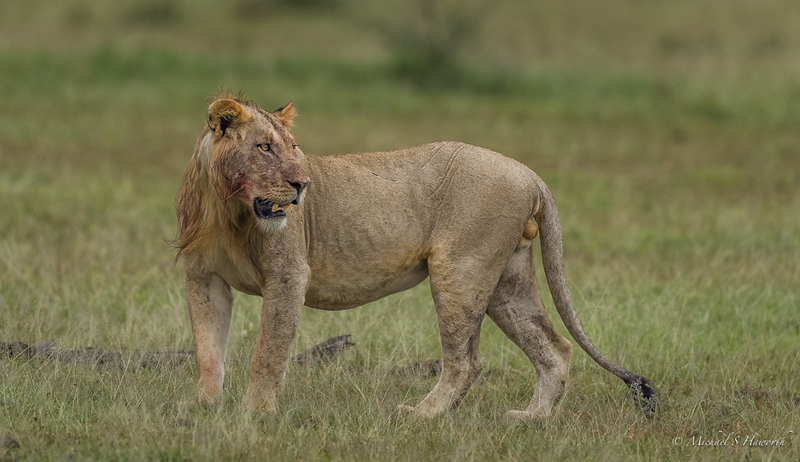 There we found three of the five young males which were part of a coalition of eight males. These young males were big strapping brutes and they had attitude. We found them on the dam wall. They had just finished feeding on a kill judging from the blood stains on there faces and necks. They were also in the process of tangling with a large clan of hyaenas which wanted to knuckle in on the remains of the kill. No one got injured in the tangle from what we could see but the males were whipped up with testosterone. It was very clear that the young males were ready to carry on the fight. You can see from the sheer bulk of these youngsters that they were big brutes which would be come fearsome males in adulthood. After the lion-hyaena interaction broke up we moved away and drove back towards the Kitunge hills and the plains in front of them. 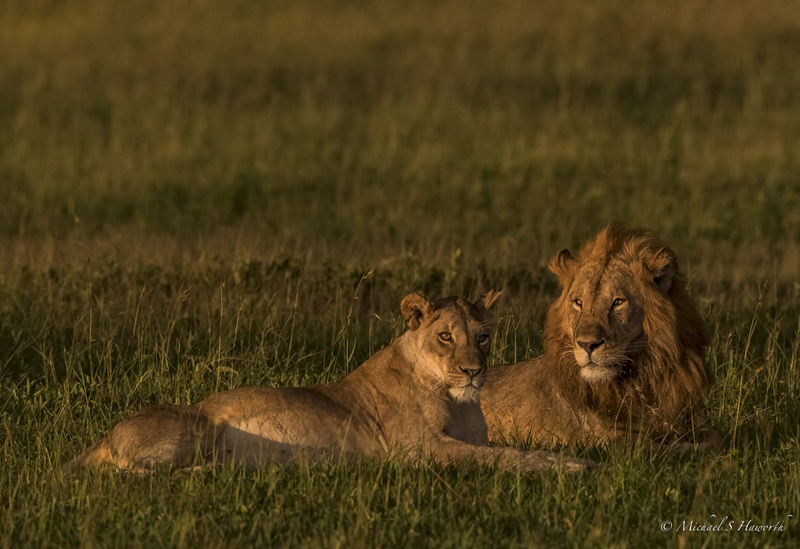 There we found a mating pair of lions and several lionesses which were part of the pride. One lioness had two cubs. We sat and watched them for about an hour but they became flat cats and as the light deteriorated it became more overcast so we left the pride in peace and returned to camp for a late breakfast. That afternoon it was still overcast when we returned to the plains below the Kitunge hills and found this lioness calling to her missing cub. She was calling with that low frequency “ooomph”. She was looking toward the section of trees a couple of hundred metres away. 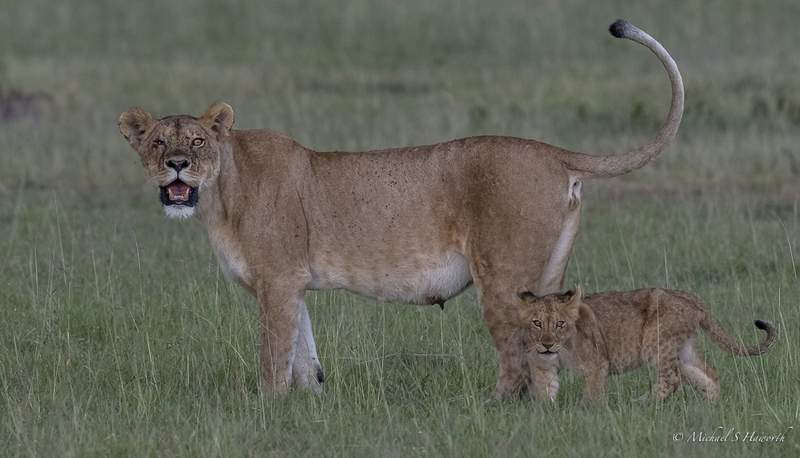 Something must have happened since we had seen them in the morning which could have separated her from one of her cubs. It could have been buffalo bulls which had been in that area. One aspect about wildlife that becomes quickly apparent is that if the animal incurs and injury that animal must heal itself. There are no doctors. Wild animals’ ability to cope with their injuries and heal quickly is something that the medical world has not paid enough attention to. This lionesses decided to start walking toward the tree line from the middle of the plain. She had her one remaining cub with her. 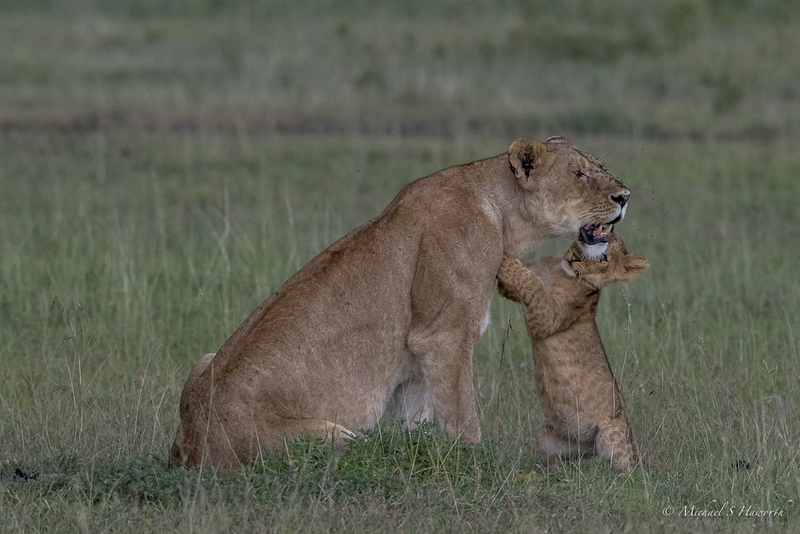 The remaining cub was trying to get her attention and play with her but she was focussed on finding her other cub. 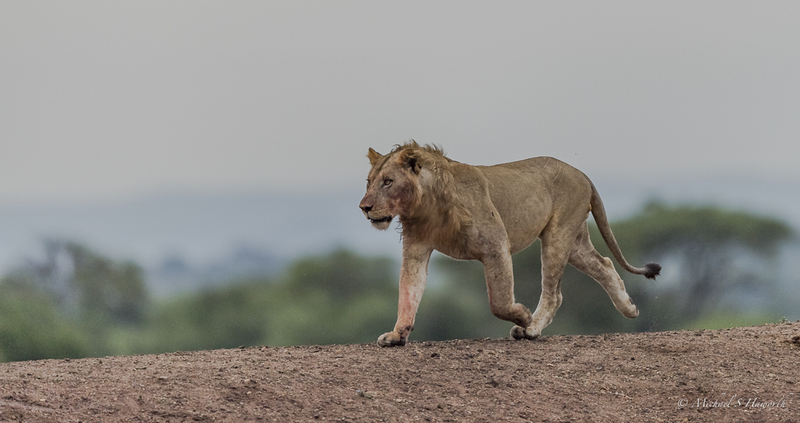 She walked to within one hundred metres of the treeline and could not see or smell or hear her cub so she turned around and walked all the way back to the rest of the pride which was lying in the middle the open plain. 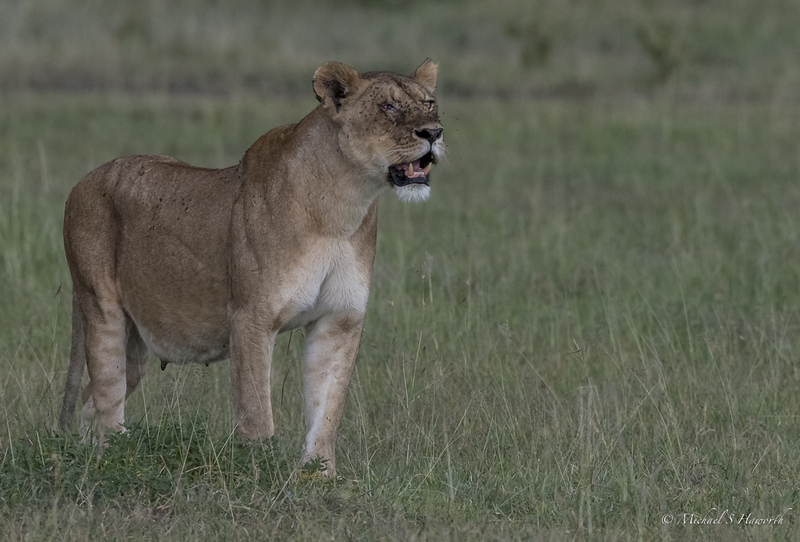 We watched this lioness desperately looking for her missing cub for quite awhile. There was thick cloud cover and storm clouds started to form. Amongst the banks of storm clouds, breaks in the formations allowed shafts of sunlight to shine through onto the plains. 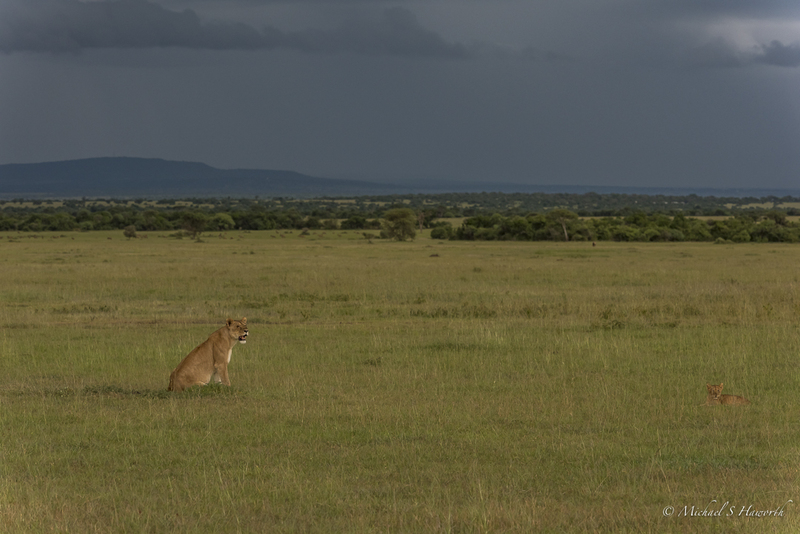 We continued to sit with this lioness as the storm clouds built and the sky turned an ominous dark blue with a heavy bank of cloud developing over the range of hills in the distance. This is a time in the bush when the light dances and the atmosphere starts to prickle with excitement. 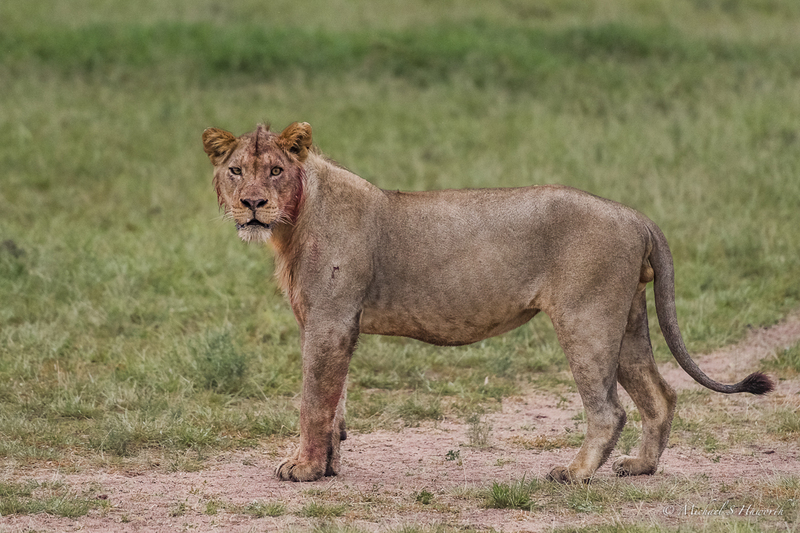 We drove closer to the lion pride once the lioness joined the pride with her remaining cub. 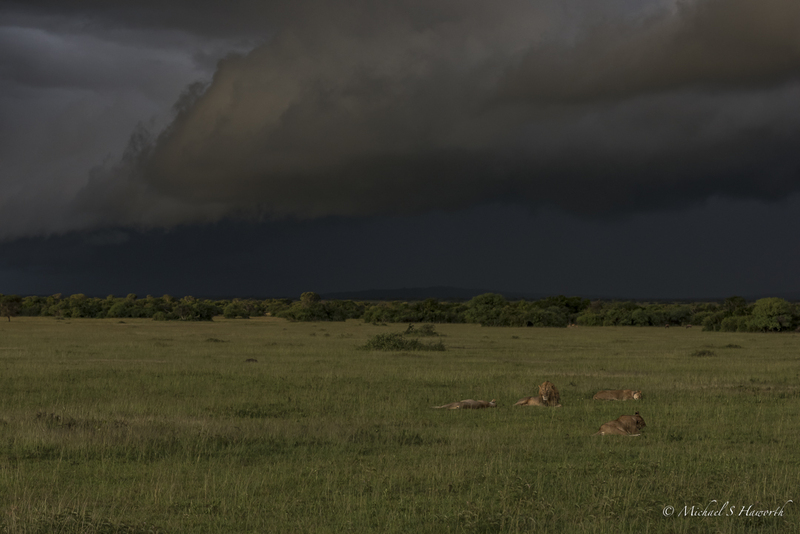 The lions seemed completely unperturbed by the brewing storm. It was as if they had already accepted they were going to get drenched. One of the unexpected developments was that the remaining sun shone through the building banks of storm clouds creating a beautiful rainbow beyond the treeline. In among the far trees was a herd of Topis. It is impossible to describe the colour of the light and the feeling of being bathed in it. 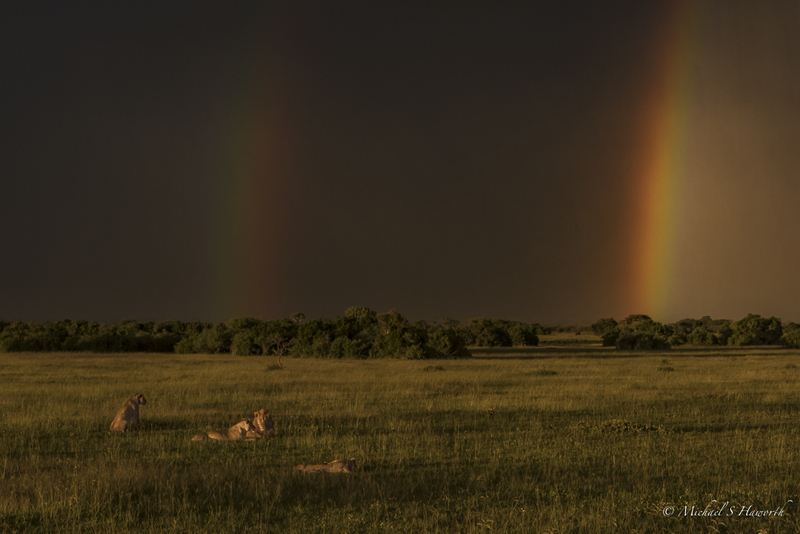 The lions became illuminated in the grass. As a photographer you can usually only dream of seeing this type of light. 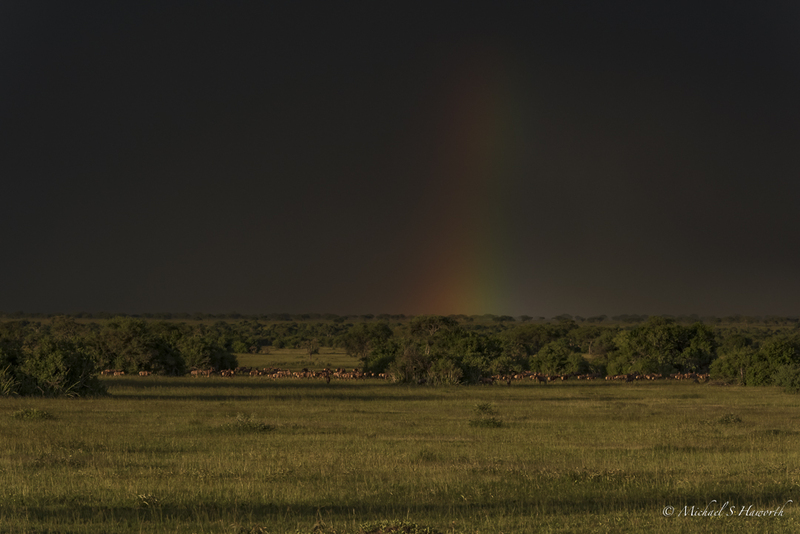 As the storm brewed and the rain clouds gathered the scene darkened and the light became even more dramatic – and a second rainbow formed. This was one of the most magical light shows I have ever seen mother nature put on. We started the day with overcast blue light and finished the day with the most incredible golden light show. This was again a reminder that you can never predict what mother nature has in store for you. What ever you do, you have to be out there to be able to see and experience this type of magic. Love your second-last photo – the most beautifully “posed” studio portrait of Mister and Missus! Thanks Frannie – yes the light was exquisite for just a few magic minutes!! Would you understand if I commented in Afrikaans? Ja Frannie ek kan Afrikaans lees! So bly om dit te hoor!